I messed with the Penrose Kites and Darts yesterday until I was sick of them. Threw away almost everything that I had done and will try a fresh start. I have 3 pictures of what has been represented to be the Infinity Sun pattern. There is some similarity in them but they all look different to me. The one that I got from the Flash site is the largest and covers the most 'plane' but I'm not convinced that it follows the 'rules' for the Infinity Sun. I think I'll give it a rest and see if I can finish the GIMP pixel drawing. It has been moving along well and would have been finished long ago if I was not so obsessed with expanding the Penrose pattern larger than what is shown in one of two pictures on the web. This was the last of 5 "Essential" books that I had downloaded from FEE. They varied quite a lot in the quality of selected material with this one not being so good. I read "The Law" some months ago and there were far better chapters that could have been included in this book rather than the one that the editor decided to include. I am going to get some more of Leonard E. Read's articles and see if I like them as well as I did his "Essential" book. Losing The Alitos by David Brooks in The New York Times of 12 January 2006 was an article about the confirmation hearings for judge Alito. I have read others that have claimed that it was an Obama strategy to campaign by consolidating minority groups. But the Democrats gave up on the white working class long before he ever appeared on the scene. He simply became the poster boy for that change in the Democrat Party. In 1971, Fred Dutton, an important Democratic strategist, acknowledged the rift between educated liberals and the white working class. In a short book, "Changing Sources of Power", Dutton argued that white workers had "tended, in fact, to become a major redoubt of traditional Americanism and of the antinegro, antiyouth vote." Suggested reading: How Democrats Killed Their Populist Soul by Matt Stoller. It is a rather long article in The Atlantic but offers up a lot of history that may explain, in part, The Donald's election. Then there is this from Dr. Hurd's blog The Awful, Awful Truth for Democrats. You see, all of this political upheaval is worse for Democrats and progressives than anyone else. They’re the ones who had the most to lose by the resurgence of dissenting opinion. Those of us “deplorables” on the other side had nothing to lose, because most of us never wanted the federal government so involved in the individual lives of citizens of the American republic in the first place. We’re all used to the hostility and arrogance displayed by intolerant, rude progressives during the Obama years. When Donald Trump throws it back in their faces, it provides a refreshing sense of justice in what many feared had become a malevolent universe populated by pretentious, know-nothing twits. No matter what the future holds, we know it’s possible to fight back and sometimes win, while the Democrats will face a bitter struggle — to the end — when it comes to imposing their totalitarian mindset onto the population as a whole. In short, America will not go down without a fight. Another shopping day at Olsen's in Ajo. They receive their stock on Tue, Thu & Sat which are the best days to get anything. Except for someone like me that likes to get there when they open at 7:00 and the stock has not been shelved yet. I got almost everything that I wanted but it was the last package of Romaine Hearts, the last two small containers of mushroom (I wanted a large) and after I got my two containers of Okios yogurt these was one left. So, on those days it is best to arrive around 8:00 or 8:30 but I'll keep to my schedule and complain when they are out of something. Breakfast at Granny's Kitchen was a Spanish Omelet which was not bad but not the best thing that I have had. Then on to the only difference in my shopping days - I stopped for gas at the Casino. I didn't fill the tank because it was $1.599/gal which is 50¢ more than what it is in Tucson. I added enough to get me there. This is the first pixel drawing that I did with GIMP which is free software that mirrors the features of Photoshop. It is much more powerful than MSpaint but it also has the complexity of Photoshop. The tutorial that I read through and the pixel art Forums that I have scanned have said that a noobie should first learn to draw straight lines and curves. So for my first attempt I went back to the first drawings that I did on HTML Canvas which were all straight lines - quilt blocks. These gave me some good practice in using GIMP. Drawing straight lines, selecting colors and most importantly learning how GIMP works. There are a lot of things that I want to do and still have not found out how. I'm not sure what my next subject might be, maybe back to the cross stitch web site and see what I can find that is about this same size 100x100 pixels or the 'standard' avatar size of 128x128. Another good posting by Scott Adams, AKA Dilbert Is President Trump Doing Management Wrong?. I have selected only a small part of it to quote - recommended. The world is watching Trump trade some “chaos” to get the benefits of entrepreneurial management. It’s fast and messy, but he’s testing in real time. He’s watching protests. He’s watching news coverage. He’s watching social media. And he’s rapidly adjusting as needed. The net effect of Trump’s bias for action in his first week is that he created a presidential brand of being the most action-oriented president of all time. Your first impression will be sticky. If things work out for Trump, you will forget any temporary “chaos” and remember him as the most effective president in history. Success fixes everything. Every entrepreneur knows that. I suspect that the only constructive thing I will do all day was done right after our morning walk - laundry. Although I will be constructing another GIMP pixel picture. I found a 114x118 cross stitch pattern that looks like it is something I can do in pixels. It is not so much the size that I now approach with trepidation it is the number of colors that are used. I also need to gain some experience in looking at the cross stitch colors and be able to select something close from the 'color palette' in GIMP. I am not restricted by GIMP, I just need to learn how to use its colors. This is the Penrose Infinite Sun pattern that I have been struggling with for many days. I had started to have a strong suspicion that this group of Kites and Darts would 'tile' with another group of Kites and Darts called the Infinite Star pattern. The pattern that was offered up as an Infiniti Sun tiling that I wasted bandwidth on was NOT and it led me astray. I looked at this Sun pattern and the Star pattern on the University of Wisconsin - Green Bay web site many times and drew it almost as shown once. But I kept trying to extend the tiling using this same grouping off Kites and Darts and failed every time. Partially because I had an error in drawing the group but more importantly I could not wrap my mind around what I was being told on the site. My added emphasis. 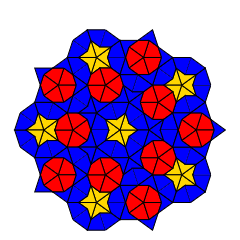 "This pattern, named for the star at the center, is called the Infinite Star Pattern. 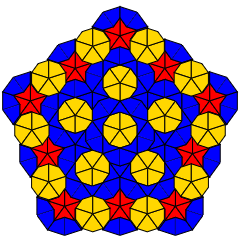 There are an infinity of Penrose Tilings. This one contains a decagon at its center instead of a star (It's called the Infinite Sun Pattern). Yet note that large parts of the two patterns are similar. 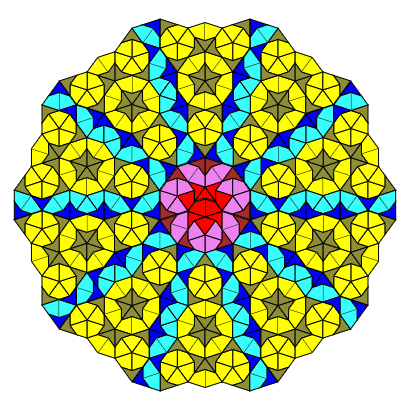 Penrose Tilings have a number of astonishing properties. One is that any finite portion of any tiling is contained an infinite number of times in every other tiling. This means that you cannot tell, by examining a piece of a tiling, which pattern you are on." Does anyone, except codgers like myself, remember the Free Speech Movement and protest at Berkley in 1964-65? That was a protest that insisted that the university administration lift the ban from on-campus political activities and acknowledge the students' right to free speech. The protest/riots now are for a ban of on-campus political activities (if they are not Progressive) and ban student from listening to free speech. We have really come a long way under the Progressive ideology that has become dominant since those good old days of the '60s. I think I'll do even less today than I did yesterday. That means I will not do laundry again. I will do more drawing on my most recent pixel art effort. I made a good start on it yesterday but it is going to take some time to finish. There will be about 13,000 pixels in the drawing but fortunately I do not have to place (click) on each one. I can draw the outline of a section of the total picture and then do a 'bucket fill of color' within that outlined area. There are still plenty of outline pixels that do need to be drawn and I'll be at it today. I also have The Rebirth of Liberty: The Founding of the American Republic 1760-1800 by Clarence B. Carson downloaded and have started to read. Unfortunately I could only find it in .pdf format so I am reading it on my laptop using Adobe Reader which I do not like nearly as well as my Paperwhite. I do have Prejudice: Third Series on the Paperwhite and should finish it in another couple of days. Reading and drawing is all that I have planned for today. There will be some web browsing done also but that is like saying that I will eat. I have been doing our afternoon walks in a t-shirt for the past 2-3 days. This morning's low was just fractions below 50° and I did it with no gloves for the first time in months. The high today is expected to be 77 but the shocker is next Thursday which the weather guys think will reach 85. We just had Winter and they are now predicting Summer. I made what I think is a lot of progress on the GIMP pixel drawing yesterday. I am over half way finished, maybe even 2/3s. It is far enough along now that it is starting to look like the picture on the cross stitch web page. Encouraging! I also got a lot more of the Mencken book read. Maybe finish it today or tomorrow for sure unless I spend all my time doing the pixel art. That is about all that I have happening. I did get some more 'linners' prepared this morning which will last me until the next shopping day. I have also started to think about what my route to the next camp will be and doing some web searches for a breakfast stop. I'll get the 3x5 route cards prepared next week some time. Another very nice morning plus Patches let me sleep in for an added 30 minutes. It was almost daylight by the time we finished our walk. This was the third of six in the Prejudice series. It was no better nor worse than the previous two. There were some essays that I enjoyed very much and there were others that I could have skipped and not missed much. I can not find the remaining three in the series as free downloads but even if I could I probably would give them a pass. I'll see if I can find some more Mencken because when he is good he is very good and when he is bad he is horrid. I am almost finished drawing the pixel art. I'll be doing some final touch ups and get it posted tomorrow. I'm very pleased with this one although it is not great art, more akin to doing an adult Paint By Numbers. I'll be starting the Penrose Infinite Star today. It should be easier to do since I have all the Kite and Dart 'groups' already coded from doing the Sun. It will take some time to get them located properly but overall easier. The past two days my Verizon usage has gone up far more than my usual reading habits support. I don't know what is going on again. The Park WIFI has also been down so that has not offered an alternative. I may be on the couch with my Paperwhite a lot more today. Another pixel art drawing that comes from a cross stitch pattern. I'm getting better at finding my place on the GIMP grid that corresponds to the cross stitch grid but it is still a process. I did some work with the color palette for this one and I think it looks pretty good. It does not quite match what is shown on the cross stitch web page but is close. I am finding that I need to use brighter shades for this than I can use on Canvas, pastels do not show up very well with just a few pixels. I have also almost finished the Penrose Infinite Star pattern drawing. There is no way that I can see that it will join/match up with the Infinite Sun pattern. Each pattern may appear within a larger overall 'tiling of the plane' but I don't think they are adjoining. I have found one larger tiling that uses Kites and Darts that I may try to draw. But first there is a classic pattern called the Cartwheel that I want to do. It may be a few days before I get started on it because I have another pixel art drawing awaiting. The Left Hates You. Act Accordingly by Kurt Schlichter is an article that the Lame Stream Media would not consider publishing. Not because it is Fake News but because it contains so much truth. The New Leftism is the secular religion of our time and as dangerous as any religion of any other time. This is the Infinite Star pattern. As I said I see no way that it adjoins the Infinite Sun to 'tile the plane'. This came from the same Wisconsin web page as the Infinite Sun pattern that I posted a few days ago. The 'interesting' thing that I found in trying to draw it as shown is that the Center Sun was oriented at 270° but the Star was at 252°. This caused me a lot of re-writing of code, especially when I did not recognize that at first thinking it was 234°. Moving on to the Cartwheel pattern soon. This morning was my last shopping trip to Olsen's - this stay. Of all the small town markets that I have been in Olsen's in Ajo is at the top of the list. I complain but they do a better job than most. If you are staying in the Ajo area there is not much choice but I highly recommend them. The same recommendation holds for Granny's Kitchen in Why. It is a bit out of the way if you are staying in or near Ajo but is the place to have breakfast if staying near Why or passing through. I also suggest their Eggs, Tamale and Beans breakfast. Almost everything on the menu that I had was good but this dish is the best of the lot. Last breakfast there this morning also. I think I have found the cause of my high Verizon usage - Microsoft Malware Protection Command Line Utility, part of Windows Defender. I did some tweaking of NetWorx and found that the Utility used about 40% of the total bytes that I used yesterday. This morning by 8:00 I had used about 1/2 or my self imposed daily quota or 100MB and 77MB were for Microsoft Malware Protection Command Line Utility. As I see it the way that Window Defender is protecting my computer is to use up all my bandwidth so none of the 'bad guys' can access it. I have looked on-line for an explanation and a fix and have not found anything that I understand. I have gone to the Windows Task Manager this morning and stopped the Task. How long it will stay stopped and what the consequences might be are big unknowns. The other useful thing that I did was the dumping chore. Part of getting ready for my move to the next camp plus it was time that I should do it. Added fresh water as well so those chores are taken care of. Have also cooked up enough 'linners' yesterday and this morning that will last me until my next camp. Tomorrow I'll get enough breakfasts ready. The latest pixel art is moving along slowly. It is about the same size 15,000 pixels but most of them will remain blank background. However, I think I will have 'click/placed' color for more individual pixels in this drawing than any of those I did previously. No bucket dumps of color in this one. I think I have also discovered how to save the completed drawing with a transparent background. I'll know for sure when I try to do it in a few days. My battle with Microsoft Malware Protection Command Line Utility/Windows Defender continued yesterday morning after I posted to my web page. By 11:00 total usage per NetWorx was not quite 270MB with Malware Protection at 206 and Host Process for Windows Services at 20MB. I am paying Verizon monthly to receive this? I went back on-line and found some web sites that told me how to disable Defender - Windows will NOT allow you to uninstall. I think I have checked/unchecked everything and so far it doesn't come back when I re-start the computer. To provide a longer term fix for this problem I have contacted a couple computer service shops asking if they can change the operating system to Linux-Ubuntu for me. That would also mean re-installing the few applications that I now have running under Windows such as GIMP and Adobe Reader. It also must connect to Verizon. I got my 3x5 route card prepared with a restaurant, gas station and market picked out. My travel day is also shopping day so I included a grocery stop along the way. I also included a detour to check out a possible RV Park for the future. I have a reservation at my next camp but when I tried to send them an email to tell them I was still on the arrival date scheduled the email was bounced back. I then went to their web address and that no longer exist either. I did find a Fakebook page so it does appear that they are still in business but certainly not much exposure. This pixel art piece does not look like it would be very difficult but I placed every pixel individually, not much opportunity for bucket dumps of color. The red lines for the most part are one pixel in width and most of the blue is three pixels wide. I was able to save this with a transparent background which was one of the big selling points for moving from MS Paint and learning how to use GIMP. I'm happy! I have found a few more cross stitch patterns that are of this same size, between 100x100 and 128x128, and have 12 colors or less that I will be drawing. But there is the Penrose cartwheel awaiting to be drawn next and I'll be starting that later today. The high temperature on Thursday was 79.4° which was not too bad. When we got back from our walk I had all the windows in Desperado open and there was a slight cross ventilation breeze. Yesterday the high was 88.1° and there was no cross ventilation - it was HOT. I fired up the A/C for the first time in 2017. The weather guessers think it will be down to more reasonable 76 today and even lower tomorrow with a slight chance of rain. My next camp is showing the expected highs to be in the 60s. That is better, I'm not ready for summer yet I need some spring first. Today I started the house cleaning chores that needed to be done and I usually do them just before a move. Got the bathroom cleaned and then bathroom plus kitchen floors washed down. This was done in small increments between cups of coffee. I'll get the living room carpet vacuumed this afternoon and work on the cab area tomorrow. Since shutting down any updates from Windows I have been using very little of my self imposed Verizon bandwidth. This morning I read all my usual blogs and even did a little web surfing and used just over 20MB. I am going to cut the tether to Windows as completely as I can during the next couple of months. The Toshiba laptop that I now have was bought in Albuquerque, NM in May 2013 when my previous one died which had a Ubuntu-Linux operating system. When I bought this replacement it came pre-installed with Windows 8 but I asked to have Linux also installed. The computer was partitioned for the duel boot of both operating systems but Windows blocked the installation of Linux at that time. Now it can be done and I have contacted a woman in Sierra Vista, AZ that is going to help me do the install. I may then be using both operating systems for some time until I get up to speed with Ubuntu once again. I will also have to find applications that will run on Linux that do the same things that those I have on Widows so. Most of the applications come in both Windows and Linux versions but some do not. I finished almost all my household chores this morning and ready to leave. I will do the final counter and stove top cleanup after 'linner' on Monday. Because of the added detour that I have built into my route on travel day, as well as a slightly longer route even without the detour, it is going to be rather long day. I need to rest up but the Penrose Cartwheel has proved to be a challenge not affording much rest. I was surprised that this book was published in 1906. I did not look that up until I had finished it and found that he wrote with prescience. It is heavily laced with Wells' socialist beliefs and could be a good example of a book that Mencken disliked so much since Mencken hated Socialism as much as he did Democracy. It is not one of Wells better book but was a very entertaining read. We had a light rain yesterday morning and then again in the early hours this morning. Not much either time with Ajo reporting 0.05" yesterday and 0.01" today. It looked like it was clearing when we went for our morning walk and the weather experts forecast 0% chance of rain. The same chance here tomorrow with a slight chance at my new camp so travel day should be good with no strong winds expected. I had to almost start over with my Penrose Cartwheel drawing. The Center of this pattern has been really difficult. Finally, I think I have got it right, or as right as I'm going to get it. The spokes of the wheel and the segments in between look like they are going to be no piece of cake either. I'm getting there but this one has been a struggle. A New Jacksonian Era? by Jim Quinn is a very good article that compares Andrew Jackson to Donald Trump. I have selected Jackson quotes from that article and suggest that you read it. It is to be regretted that the rich and powerful too often bend the acts of government to their selfish purposes. Distinctions in society will always exist under every just government. Equality of talents, of education, or of wealth cannot be produced by human institutions. In the full enjoyment of the gifts of Heaven and the fruits of superior industry, economy, and virtue, every man is equally entitled to protection by law; but when the laws undertake to add to these natural and just advantages artificial distinctions, to grant titles, gratuities, and exclusive privileges, to make the rich richer and the potent more powerful, the humble members of society—the farmers, mechanics, and laborers—who have neither the time nor the means of securing like favors to themselves, have a right to complain of the injustice of their Government. Is this the path that The Donald has been on for the past two years and he is now at the "they fight you" stage? Today has been a long day and we got started a few minutes later than I wanted but Patches is not quite the alarm clock she once was. She lets me sleep in a few minutes longer sometimes. My usual route from Hickiwan Trails to Quail Ridge is only 187 miles. I managed to turn that into 295 miles by going through Casa Grande and then adding a detour. The detour was to check a RV Park that I was considering for next winter. Didn't even stop, just turned around - no curb appeal! It is also down wind part of the time of a large dairy operation that is 1/2 mile away and an even larger feed lot that is about 3/4 of a mile. It was not just the distance but I had a wait at Big House Café for breakfast. Not my kind of place that takes your name for a table but sometimes you do what you have to do. The breakfast was a little pricey, the RV parking requires that you be lucky but the food was good and the service was excellent. I also stopped at Fry's in Casa Grande for gas and groceries which took more time than it would have if I knew where everything was. The cross-Tucson routing was not too bad although it did take more time than my southern route does. This is the route with none of the detours listed while in Casa Grande: AZ86, Indian15/Chuichu Rd/Florence St, Florance Blvd, AZ87, South I-10 Frontage Rd, North I-10 Frontage Rd, Park Link Dr, AZ79, AZ77, (in Tucson) AZ77/Oracle Rd,Ina Rd/SkylineDr/Sunrise Dr, Craycroft, Grant Rd/Kolb, Valencia Rd, Haughton Rd, Sahuarita Rd, AZ83 & AZ82. Note: Park Link Dr is a wonderful example of all the plants of the Sonoran Desert, well worth the drive. I got hooked up to electric and then took Patches for her afternoon walk. She had a hard day also and has collapsed at me feet since we got back. Started 'linner' and then sat down to type this - I'll post it and then in is 'linner time". It was late yesterday and I was tired which is my excuse for not writing about my visitor on the 13th. Geogypsy has been living fulltime in an RV for 25 years. In fact she now has two; a fifth-wheel that serves as a mobile sticks-n-bricks and a pick-up slide in camper for the tow vehicle. She has been a seasonal National Park Ranger for some of those years, most recently at the North Rim Grand Canyon. While working at the Rim she lives in the fifth-wheel but during the off season she does some mini-vacations with the pick-up camper. That is what she was doing when she came to the Ajo/Why/Organ Pipe area and stopped by to visit me. We had a long talk and it was surprisingly how very little was about living full time in a RV. So much other 'stuff' to talk about. It was good to meet the person that writes a blog that I have been reading for a few years. It was noticeably colder here this morning than what we have been walking in - 38° with a colder forecast for tomorrow morning. Mostly mid-60s forecast for the highs with the exception of this coming weekend that is expected to be below 60 and have a 60-80% chance of rain. I will have the Wave 6 back in operation soon, maybe even today since it is not warming up very fast. A New Jacksonian Era? (Part Two) by Jim Quinn continues to compare Jackson and Trump. He closes this article with some hope but not much confidence in a President Trump accomplishing as much as did President Jackson. He got this comparison 'right on' however. History is not only rhyming this time, but the response from the fetid establishment creatures of both parties inhabiting the swamps of DC is identical to the response received by Jackson almost 200 years ago. Trump’s honeymoon didn’t last 5 minutes, as Soros and his well paid domestic terrorist organizations have waged non-stop violent protests on behalf of the corrupt establishment. The level of disgruntlement and faux outrage from the left wing establishment, right wing neo-cons, and their corporate media mouthpieces, with the results of the election is historic in its level of intense hatred, dishonesty, and blatant disregard for facts. My space here at Quail Ridge is the one that I wanted because it is easy to get in and out of. I'll be doing more of that than usual because this is my 'domicile' location and I try to take care of all those things/appointments in a couple months that a sticks-n-bricks lifestyle can spread over the entire year. The negative is I have close neighbors with the one on my passenger side being a Class A that is parked there with a For Sale sign. No people to bother me but it is blocking my good view of the Whetstone Mountains - not good. I went to D & J RV Center this morning and made an appointment to have my A/C serviced. We also talked about the RV generator and I made an appointment for that after the A/C has bee serviced and working. If the servicing does not improve the performance than a replacement will need to be considered. We will see next week. Also stopped by my vet and made an appointment for Patches' annual visit. General check-up and shots. She is doing well but I know she has the hip dysphasia problem that will only be getting worse as she gets older. She was not happy with me leaving her this morning, barking when I left her which she knows is a no, no. A stern lecture about her unacceptable behavior seems to have been taken to heart. She is mostly a good girl! Then THE appointment of the day with a woman that was going to help me with my computer problems. I was hoping that I could install Linux-Ubuntu side-by-side with Windows and eventually not use Windows at all. After a couple hours we finally decided that it was not possible. Microsoft put into the motherboard a 'feature' that prohibits installing any other operating system other than Windows. So I have to now bite the bullet and install all the updates to Windows and also find out why the Windows Defended updates have failed to install. Need to get them updated also and then live with the constant Windows updates until I can find some replacement for this computer and a Micosoft operating system. Have used 474MB on Verizon so far today trying to get that done. I am NOT a happy camper! I have had better success with the Penrose Cartwheel drawing over the past few days. I am now well into the kite and dart shapes that make up the third, or outside and final, ring in the pattern. probably will not finish it today but there is a chance that I will do so tomorrow. Sort of looking forward to doing some more pixel art, this tiling has been a hard one. I said that I got all the updates to update yesterday. This morning I had 5 "Important" Security Updates and 1 Defender update. I have selected to have them automatically install but since they had not done so I clicked on the Install Button and all the Security Updates did install successfully but the Windows Defender FAILED. Tried it again and it failed again. I made more progress on the Penrose Cartwheel late yesterday afternoon and last night but not finished. I don't think I will be able to finish it today either but maybe I'll get inspired and see how to do it. The Trump Presidency: RIP by Paul Craig Roberts claims that "Trump has been defeated by the deep state" with the firing of General Flynn. It is an interesting article although I think Mr. Roberts having declared President Trump defeated and dead a little premature. I will grant you that IF the Establishment can not bring him down soon using their current tactics then his life is very much at risk. They WILL attempt to kill him before they will allow him to succeed. I did a Full Scan of my computer yesterday using Windows Defender. It took over an hour to complete the scan of 566,567 items and no threats were detected. It also claimed the Virus and Spyware definitions were up to date in spite of that Failure that I had yesterday morning. So, what do I believe? The scan is correct without that Failed definitions update? The scan is worthless and Windows Defender is nothing but hype? Another reason for wanting to get OFF Windows? I ran the Windows Update Troubleshooter yesterday after getting back from our walk. This was suggested in one of the many 'fixes' for the Failed Defender definitions issue that I, and many others, have had since Defender was built into Windows. The only thing that I could see that I did yesterday was use up another 132MB with Verizon. I also saw that the 'Last checked for updates' and 'Last updates installed "counters" had been changed to NEVER for both. This morning I have yet to receive any more updates but I did get another Defender update yesterday that failed to install. That was before I ran the Troubleshooter so I don't know if running it has made any difference or not. The weather guys continue to predict a 70% chance of rain today. So far nothing but it does look like it could at any time. Their forecast high of 55 today may happen also. It has been slow to warm up and I got the Wave 6 working again around 8:00 when it was still below 50. Tomorrow is expected to be even colder and there is a Wind Advisory but there is almost always a wind here in the spring it is just a matter of how hard it will blow. I have almost finished reading In the Fourth Year: Anticipations of a World Peace by H. G. Wells, maybe tomorrow. What I have found so far are a couple of his prescience observations that I think are interesting since the book was published in 1918. Moreover, from Africa there is always something new in the way of tropical diseases, and presently Africa, if we let it continue to fester as it festers now, may produce an epidemic that will stand exportation to a temperate climate. A bacterium that may kill you or me in some novel and disgusting way may even now be developing in some Congo muck-heap. There is not a capital city in Europe that twenty years from now will not be liable to a bombing raid done by hundreds or even thousands of big aeroplanes, upon or even before a declaration of war, and there is not a line of sea communication that will not be as promptly interrupted by the hostile submarine. I had another Windows Defender update notice yesterday afternoon. I have selected for the updates to install automatically but this one had not done so yet so I installed it. It FAILED, so I clicked the TRY AGAIN button and it FAILED again. Only wasted 13MB in this exercise which can be added to the 132MB that I seem to have wasted by running the Update Troubleshooter on the 17th. I did that after we got back from a rain shortened afternoon walk. When we went out there was a slight sprinkle and then it stopped and I thought we might get our walk in. But, the rain came back at about the half way point and we got a little wet before reaching the shelter of Desperado. Wind blowing, cold and rain - not a good day for man nor beast. The high was 58° but that didn't last long, it was 45° three hours later when we went out to walk. It remained cloudy this morning with the low at 35° but felt warmer than that because the wind was almost calm. The weather guys think there is a 40% chance of more rain although we did not get much yesterday. Cold predicted for all day and I have had the Wave 6 burning since we got back from our walk. The 10 Day forecast expects it to warm up and be mostly in the 60s but near 80 on Wednesday - I don't think so. Wells was all in for the League of Nations and worshiped President Wilson. About half the book is devoted to supporting the League and he would have been overjoyed with the establishment of the EU and crushed by Brexit. The other half of the book is devoted to his strong support for Proportional Representation. Not a book that I would recommend, nothing new in it that Wells has not written in other better known books. I think the idea expressed in this quote is true of peoples actions in more places than just economics. Something to ponder. We did get a little more rain yesterday in the early afternoon but it was clearing by the time we went for our walk. Did a longer one to make up for the foreshortened afternoon one Saturday. I also got started on my next GIMP pixel art drawing. Much more complicated that those that I have done previously with more colors although I am not using as many as the cross stitch pattern wants me to use. Many of their colors are so close to being the same shade that I can not see the difference in the pixel drawing. This one is going to take some time. Went to D & J RV Center for my appointment but stopped at Denny's along the way for breakfast. Had my usual Santa Fe which I never tire of since I only get it about 4 times a year. Although I may have it more while I am near Sierra Vista and will come to town often. The A/C unit had a lot of cotton like 'stuff' blocking the cooling fins. I suspect the cottonwood bloom that I experienced in Dolores, CO is what contributed to that problem. That was cleaned out, the A/C checked over and pronounced good to go. They then checked out the generator with the thought that it was most likely the carburetor but found that it was more likely the choke. They adjusted that and it was running very nice here at 4,000'. I will try running it some more while I am here and if it is stuttering, smoking and/or dies I'll be taking it back for another try. Got away cheap! Next was a hair cut. It was past time for one but I didn't want to wait around in Ajo for a shop to open. Today was a good time. It was almost 10:00 by the time I got to the shop so they were open with only a very short wait. Another chore struck off the list. I'm on a roll! Last stop was at Fry's for groceries. They are one of the few markets where I can find chopped hazelnuts which I like a lot for my Greek Gods, fruit and nuts deserts (got some Greek Gods again after months of going without). Inquired about buying a case of the 6oz packages but they would not give me a discount in the price from what they sell the individual packages for (a little over $0.90/oz). I may buy a few pounds from Nuts.com which offers one pound bags for a little over $0.80/oz or a little over $0.60/oz if bought in 25# bulk. Tomorrow is eye exam day. That should complete my chore list until the new glasses are ready. Maybe do nothing until my next grocery shopping trip on Saturday or Sunday. Yesterday morning as I was driving into Sierra Vista I could see that the Huachuca Mountains were dusted with snow down to about the 6,000' level. By the afternoon when we went for our walk, in very comfortable temperatures, I could see snow only on the top peaks. We are now back to lows in the 40 and Highs in the 60s which is great. When I fired up my computer for the day I saw that I had received another Windows Defender update that used about 1/2 of my daily Verizon quota. Once again Defender claims to be Up To Date but the Windows Update History page shows that the 2/20/2017 Defender Update FAILED. I don't understand but have quit trying to fix the problem which only has used up even more Verizon bandwidth and fixed nothing. Today I turned on my computer and connected to Verizon and did nothing else to see what the usage would be. The woman that had tried to help with the dual boot said that the Windows Updates were released on Tuesday so I was anticipating a flood of usage. After about 15 minutes there had been only 888KB of usage which seems to have been just 'talk', getting ready for the day. When I got back from Sierra Vista and turned the computer on again, it moved up to 1.24MB with me doing nothing but turning it on. No big Windows Update nor any Windows Defender yet today. I was hoping that the generator would perform well, leave me some funds that were mentally earmarked to fix it and could be redirected to buying a replacement computer with Ubuntu pre-installed. After stopping at the Landmark for breakfast I started it up and it ran well - for about 3 minutes. It then died and would not start and run again. Back to D & J sometime next week. The eye exam did not take long and my prescription was changed only a little although I measured 20/40. Good enough to still drive but certainly not 20/20 and even with glasses I probably do not ever measure 20/20. Lighter lens but probably not noticeable with 'safety glass' although not at the level of 'safety glasses'. The computer fund took a hit but I was expecting this so it is still all about what will the generator cost me. When I got back to the Park I dumped holding tanks. The spaces here are a bit narrow so I got up close to the sewer dump, took care of business and moved to my usual spot in my site. Then hooked up to electric and added fresh water. Did nothing more on the GIMP pixel drawing yesterday. Maybe get to it again after our afternoon walk. Fight of the Century by Jeff Thomas is an attempt to show how history rhymes. It may do so but there is the possibility that nothing will become of the Joint House Resolution which even if passed does not have the same status as a Bill. I find it of interest that the Resolution was introduced by a Democrat on January 3, 2017, prior to president elect Trump taking office. Why would a Democrat want to do that? Perhaps because now people like Mr. Thomas are pointing the finger at President Trump as being the war monger ready and willing to go to war with Iran, Russia and China - simultaneously I presume. In March 1933, the Enabling Act was passed by the Reichstag, Germany’s parliament. Its purpose was to provide Chancellor Adolf Hitler with the ability to bypass the Reichstag. It allowed him (amongst other measures) emergency powers to legally wage pre-emptive war without any further parliamentary or presidential approval, or even discussion. Introduced by Rep. Alcee Hastings (D-FL), the bill seeks to give the president unilateral authority to legally wage pre-emptive war without any further Congressional approval, or even discussion. James Howard Kunstler has been writing books and posts to his blog for some years now with this same theme as in Fumbling Towards Collapse. I have thought that he was right but probably premature - now I'm not so sure. If the Establishment can not take President Trump out then they will take the economy out so the 'people' will do it. This is his closing paragraph. A few minutes after we got back from our walk yesterday afternoon I checked the Verizon usage and it was the same as when I shut the computer down. Then after 15 minutes or so I checked it again and had been hit with a 133MB usage. Checked Windows Update and it said that Windows Defender Definition 1.235.3322.0 had FAILED at 4:34pm 2/21/2017. However Window Defender claims I am Up To Date with Definitions 1.235.3328.0, Last Updated @ 4:37 2/21/2017 which is NOT shown as SUCCEEDED or FAILED on the Windows Update log. I have no idea if Defender is updated or not, all I know is Windows used over 3/4 my daily Verizon data quote for the day. I shut down! kaBLOOnie asked "I wonder if Windows 10 folks have any of the problems you are having?" in my Shout Box. I gave him a short answer which I will make a long answer in this posting. The problem is with Windows Defender KB2267602 Definitions which has been an ongoing problem since it was make a part of the Windows 8 release. The same problems have continued thru 8.1 and into 10. Lots of posting about it on the web, lots of solutions for the problem - some of them I have tried and none have worked. My problem is Data Usage which I don't find anyone commenting on. I too have the Definitions FAIL but Defender says that I am Protected, shows a Definition that was last updated with a current date. So maybe I do and maybe I don't have a problem with Defender but I do have a problem with data usage. I don't think most people know, or care, how much data they use. Or if they do care they only see the total used at the end of the billing cycle. They then install ad blockers and turn off videos - been there done that. When the high usage continues they either change their on-line habits, pay for more bandwidth or do as I have done and start looking for what is doing it. Lost in Space. Out of Time by Uncola is a Star Wars parody of current event. A fun read! My data usage problem was solved for me by Verizon around 10:00 yesterday. No signal available so no data used - no problem! I did get Verizon back by 11:30 and did more reading of the book that I have in a .pdf format on Adobe Reader until that happened. Finished up the day doing a lot of web surfing and closed for the day under my usage quota. The other big Windows data user is "Host Process for Window Services". That is usually the second largest behind Firefox on any day that I don't get hit with a Windows Update or a Defender Definition Update. This morning about 15 minutes after turning the computer on it had used 135MB or almost 70% of my daily quota. Then I had the "Microsoft Malware Protection Command Line Utility", that is the Defender Definitions, use an additional 126MB or another 60% of my daily quota. So today I used 130% of my daily quota and I had done nothing other than start typing this posting which does not use any Verizon data. I then went through all my Daily blogs and alt-News sites and used 23MB. There is something seriously wrong when I am paying Verizon to have my Windows updated rather than for a service that I really want. I did a little more drawing on my latest GIMP pixel art yesterday. I will probably get some more done on it today since it does not use much if any Verizon data. Have downloaded a couple more books for my Paperwhite so I will be on the couch reading as well. The most important thing that I took away from this book was what he had to say about Socialism. When it is written/spoken of what is usually stressed is that the State takes over the means of production i. e. the State owns the factories that makes 'stuff'. However, there is also the obverse side of the Socialism coin which is the State takes control of the results of production. That has been the road taken by the USA for the past 100 years. What has become known as the Welfare State is that redistribution of the results of production; taking from the producer and giving to the non-producer - just to make it 'fair'. I turned on my computer before starting to cook breakfast. When I sat down to start my day I found that "Host Process For Window Services" had used 73Mb or 36% of my Daily quota. Speaking of quota, or budget, I am now over the limit for this time in the billing cycle. Or, as the government likes to express it I am running a Budget Deficit. Not spending/using too much; it is just that my quota/limit or the Budget is too small. During this billing cycle Windows has been responsible for over 1/2 of all Verizon data usage. This is as reported by NetWorx. Unfortunately I can not go back to see what was happening in prior months. It seems like these spikes in usage began back in November but my memory is faulty so I am not sure. I will not be doing much web surfing today and may not even read my Daily blogs or News. I do not have the same flexibility as the federal government has i.e. creating more money out of thin air. I must live within my quota/limits. I will be posting late tomorrow and probably a short posting. Will be out and about for much of the day which will keep me off the computer and help get me back within limits. I need to do something other than keeping the computer turned off however because when I turn it back on I get more Updates and the "Host" uses lots of data for some unknown reason. Windows is driving me to distraction that is for certain. I will not go so far as to say that this is Rand's best book. I think "The Fountainhead" was her best that I have read but I did like this short book that she called a poem. I do agree with the Customer reviewer that this is a very good place to start if you want to read anything she has written. The reviewers either loved it or hated it, not many in the middle, which may have been influenced by political beliefs. Anyone that thinks that the government offers a solution to the challenges that we face in life will hate it. Yesterday I posted to my web page, replied to a ShoutBox Comment, read and responded to a couple of email and did some web browsing. I did not read my usual blogs nor News. That used about 70MB and I was ready to shut down before using all my Daily quota. However when I checked NetWorx I found that I was already near my Daily quota because Windows had downloaded another update of about 70MB. I checked Defender and it said I was Up To Date and when I checked the Windows Updates log I found that the Defender update of 2/24/17 had been Successfully Installed. There was also "December, 2016 Security and Quality Rollup for .NET Framework ..." that had been downloaded and was Pending a Restart to Install. I did the restart and then the log said that it had been Successfully Installed. Later in the day I checked NetWorx again and found that "Microsoft Malware Protection Command Line Utility", which I think(?) has to do with Defender, had used another 50MB. Therefore on a day that I was trying to cut back usage to less than 200MB Windows used 202MB. Went to the Defensive Pistol Workshop sponsored by the Cochise Gun Club of Sierra Vista this morning. On the way there stopped for breakfast at Sunny D's in Huachuca City and got a very good serving of hash-n-eggs and great sourdough toast, not sour enough but nice and thick and toasted just right. I'll be stopping there again. There were 12 people shooting today but it moved along real well. I know I was jerking the trigger on some of my shots but stayed on the paper most of the time. Until the targets were moved out to about 25 yards. I can not hit the side of a barn at that range. I did shoot the one 'match stage' set-up reasonably well even with a very poor reload. One of the range masters even complimented me on how much better I shot the stage versus just the targets with no movement. Got back into Sierra Vista from the range a little after noon and started doing my 'in town chores'. Went to my UPS Store and picked up a package. Then went to Verizon and waited for 20 minutes before I could talk to anyone about my USB Modem. The guy that I talked to assured me, guaranteed, that the one I now have will plug-n-play in a Chromebook. It was a day earlier than my usual schedule but stopped at Fry's for groceries while I was close. There was also a Staples right next door that sells the Chromebook (on-line) that I am leaning toward buying. They did not have one in the store however so I didn't get a chance to look one over. I may try Best Buy and WalMart next week. So far today my Verizon usage is very low. I hope to keep it that way. I'll use very little getting this posted, will check email and maybe glance and a coupe alt-News sites to see if we are at war yet and hope I can shut down WAY UNDER quota. I went shopping at Amazon yesterday and found that the Chromebook that I had decided upon was being offered at a 10% discount. Went for it; One Click shopping and done! Anticipated arrival day is next Friday 3 March but I hope to pick it up on the 4th as I drive back through Sierra Vista from the Cochise Gun Club Match Shoot. I will skip reading most of my Daily blogs and alt-News again today. With any luck I will not get hammered with more Windows updates and can get back in budget. However, if I used nothing today that would still not do it. I need 2-3 days of very low usage to stay below my limit for this billing cycle. It is going to be tight. Since I placed the order for my New Chromebook it is time to get serious about how am I going to move Bookmarks. Went on a Search this morning and found a way to do it by sending myself an email with a .HTML file as an Attachment. That is now ready to be retrieved using the Chromebook. I have read about how I can upload my Garmin walk data from the Chromebook to Garmin Connect. I am now using Garmin Express but that is not available for Chromebooks. Will find out if what I read will work only after the fact. I could continue to use my Toshiba for that but what a lot of work that would be. My use of OpenOffice Writer has been very limited and I have done the same things before on Google Drive so that is not going to be much of an issue. GIMP is not available but there is a photo editor built in which will replace that and Picasa which I have been running in Widows. I have been using FillZilla to transfer files, mostly photos to my web page host, and will not be able to do that with the Chromebook. There is that capability within Chromebook which will require a learning curve but should work. There is also a built in .pdf Reader which will replace the Adobe Acrobat Reader that I have been using. I also have the capability, if not the ability, to add Linux as a side by side operating system and then run Ubuntu applications. Perhaps I have bit off more than I can chew in making this change but I think the time has come for Microsoft and windows to go. I forgot to tell about my meeting the Huachuca City Chief of Police while on our Saturday afternoon walk. He was doing patrol duty and parked along AZ82 where we were doing an out and back. He introduced himself as "Jim, Chief of Police" but a web search gives his name as James Thies and he has had the position only since last summer. We chatted for only a minute of two, he said hello to Patches and then a large group of motorcyclist got his attention and he pulled away but did not pursue. Yesterday I got started copying and formatting the Will Rogers week articles for next month. I should finish them today unless I get swamped with Windows updates. The process does not use too much online data but at this point in the billing cycle usage is getting serious. I used more yesterday than I had intended. Doing web searches for software/app alternatives for what I am now using that will do the same things using Chrome on a Chromebook. I don't think there will be a problem doing what I do now except I will have to do it differently and there will be a learning curve. I'll be trying to hold usage down again today. I expect that Windows Defender will be updated tomorrow for sure and can only hope that it will not happen every day this week. Maybe I will get lucky and that will be the only updates that Microsoft will have for me this week but I certainly can not count on that happening. Near the end of the billing cycle if I am close to the monthly limit I must be very careful. A short novel, or novella as Wikipedia calls it, written by Wells when he was writing the science fiction that he is best known for. An entertaining book without any of the socialism that became pronounced in his later books. I copied all my Firefox Bookmarks into a .HTML file and then sent it to myself as an Attachment in an email. When I get my Chromebook I can go to my host server, open the email and add the Bookmarks to Chrome. I did this a couple days ago and had been thinking about how to move files from Windows. Yesterday I discovered that in Google - My Drive, that I have had for some years, there is a built in file transfer. Did three files yesterday which obviously uses Verizon data so stopped until I get into a new billing cycle. But, I now know how to get my files moved from Windows to the Chromebook. Another part of this new computer, new operating system, new browser process solved - maybe. We have had almost a constant wind blowing for the past 2-3 days. This morning it looks like it is blowing in a storm but the weather guys give it only a 20% chance that it will rain. The high temperature is expected to be colder at 60° but the cloud cover kept it warmer this morning; a pleasant 52. Not much happening. I got laundry done this morning as soon as we finished our walk. Finished doing the Will Rogers weekly article preparation yesterday. I will try to do some Daily blog reading catch up until I see a Windows update come through. I'm almost within budget but Windows can still cause me to exceed my limit this close to the end of the billing cycle. I will try to get some more pixel art drawing done on GIMP today. That does not use much Verizon data so it and reading the latest .pdf download on Acrobat Reader are 'safe'. Of course reading my Paperwhite while on the couch does not use much data either, been there more these past few days. I read this book on Adobe Acrobat Reader as a .pdf download. Not as good as it would have been on my Paperwhite but was the only FREE download I could find. I liked it and looked to find some more of Carson books but so far have not found any. There are pieces/chapters of some at FEE that were written as articles but not the entire book. If you like history this is well worth your time. Great Myths of the Great Depression was written in 2012 and then updated in 2016. It spells out the causes of the Great Depression which seems to me to be a road map that we are following to the next one which will most likely be even worse. A worthwhile read.